Summer in the Rockies is one of the greatest seasons for the adventurer in all of us. The mountainous terrain and sweeping forests lend themselves to every type of recreation including fishing, hiking, mountain-biking, kayaking, and canoeing. Black Bear Ranch is a haven for all summer recreational activities. The property is located just a few minutes from Glenwood Springs (6 miles), adjoins BLM land, and is one of the larger contiguous parcels in the area. The property boasts a 20 acre lake that holds brown and rainbow trout. The lake provides ample space for kayaking, canoeing, swimming, fishing or raising a hammock for naps on warm summer days. Experience serene solitude at the lake, unencumbered views from your mountain home, and winding trails within the ranch. Just a stones through away from the property sits one of the most pristine and visited national forests in the Rocky Mountain Region, White River National Forest. Owners of Black Bear Ranch can hike, mountain bike, or horseback through the 900 deeded acres or access the 2.3 million acre White River National Forest via adjoining BLM land. 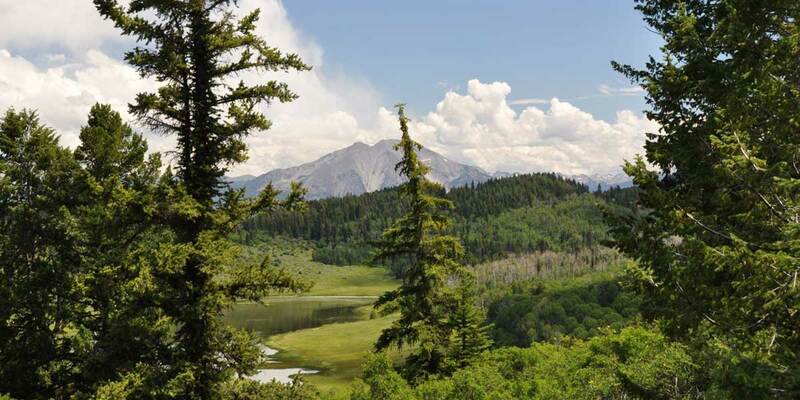 The White River National Forest includes eight wilderness areas, 10 fourteeners, and 2,500 miles of trails. Owners can trek above 14,000 ft. or take day hikes through the extensive trail network. Black Bear Ranch neighbors world class fly-fishing at the Roaring Fork and Frying Pan Rivers. The stretch of the Roaring Fork between Basalt and Glenwood Springs is considered Gold Medal designated by its incredible cold water habitat, ability to produce 60 pounds of trout per acre, and averaging 12 14” or larger trout per acre. The Frying Pan is one of the largest tributaries off of the Roaring Fork. The water for this stretch of river comes from the bottom of the Ruedi Reservoir and is consistently cold. These stretches of river can be floated or waded and are home to brown, cutthroat and brook trout. Summer in the Rocky Mountains is why people invest in Colorado. Own your very own recreational haven at Black Bear Ranch. After the summer months have ended, take advantage of bull elk and world-class trophy mule deer hunting in nearby Unit 43.